He considers Iran the greatest threat to Middle East peace, a disgraceful Big Lie. Iran hasn’t attacked another country in over two centuries. It threatens none now. Mattis opposes rapprochement with Russia, irresponsibly claiming nonexistent Putin revanchism and belligerence. During US naked aggression on Iraq, Bush/Cheney’s war, Mattis commanded the 1st Marine Division during the 2003 invasion and subsequent assault on Fallujah. Mass slaughter, arbitrary arrests, torture, humiliation and other forms of abuse targeted city residents. US-enforced siege denied them food, medicines, and other essentials – a flagrant Fourth Geneva violation, a Nuremberg-level high crime. Random bombing and rocket fire (including use of cluster bombs, white phosphorous, and other illegal munitions), massacred or wounded thousands, many thousands more displaced, homes and other property destroyed. Collective punishment included US snipers shooting “any moving body,” including noncombatant men, women, children, the elderly and infirm. A bridge connecting Fallujah to the area’s general hospital was cut off, preventing the ill and injured from reaching it for treatment – another flagrant violation of international humanitarian law. Residents were denied food, water and medical help for days. Fallujah’s football stadium became a burial ground for thousands of dead victims of US barbarism. Two Fallujah battles were fought – from April 4, 2003 – May 1, and from November 7 – December 23. Between them, US forces kept terror-bombing residential and industrial areas. Negotiations to halt hostilities failed. Washington spurned peace, chose mass slaughter and destruction instead, mostly harming civilians. Hundreds arrested went to Abu Ghraib and other infamous US torture prisons. Many died from torture and ill treatment. During combat, witnesses confirmed the wholesale slaughter of unarmed civilians in their homes and mosques, some shot after being handcuffed. Children saw parents shot. Adults saw spouses and children killed. US Marines participated in looting homes and stores, many indiscriminately destroyed. birth defects rose over 25%, many hideous from radiation poisoning; congenital heart defects had the highest incidence, followed by neural tube defects, and skeletal abnormalities. Post-9/11 alone, US wars of aggression were responsible for millions of casualties – from war, related violence, preventable diseases, starvation and overall deprivation, civilians mostly affected, continuing to die, injured or otherwise abused by America’s rage for war. Does Mattis’ selection indicate Trump’s intent to be America’s latest warrior president, renouncing peace for endless conflicts? Will lofty promises be breached? 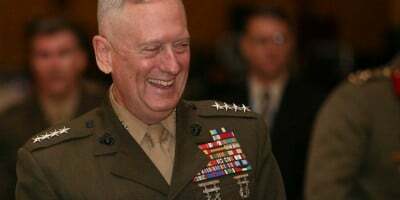 Does calling Mattis “the real deal…a brilliant, wonderful man” indicate support for his war crimes? Will endless imperial wars continue on Trump’s watch? If confirmed, Mattis will be the first retired US general to serve as defense secretary since George Marshall, appointed in 1950. Federal law requires appointees not to have been on active duty for seven years. Congress granted Marshall an exemption, likely for Mattis as well.